The Seine river loops northwest out of Paris into the rich, green French countryside of Normandy. The river is contained by low parallel ridges of hills on either side that form a kind of geologic sluice guiding the flow of the river toward Le Havre and the ocean. Some 50 miles from Paris, near the provincial town of Vernon, the River Epte joins the Seine, although to call the Epte a river is to exaggerate. It is hardly more than a creek. Nothing would make one notice this tiny riverine junction, if it were not that Claude Monet chose this area to live, to paint, and to create one of the most celebrated gardens in the world. 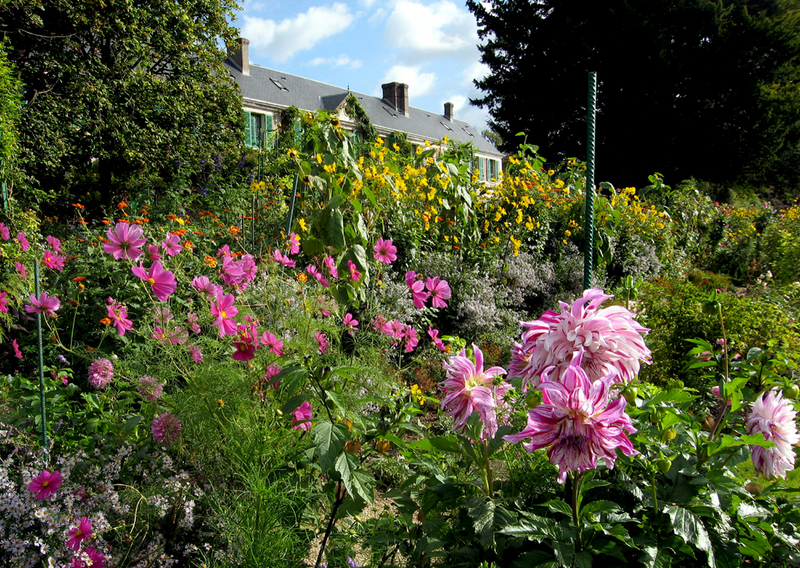 The great Impressionist painter moved to the hamlet of Giverny (Zhee-vair-nee) in 1883, and from then until his death in 1926, he cultivated the kind of garden that made his home a modern Eden. Even now it is as much pilgrimage destination as tourist attraction. 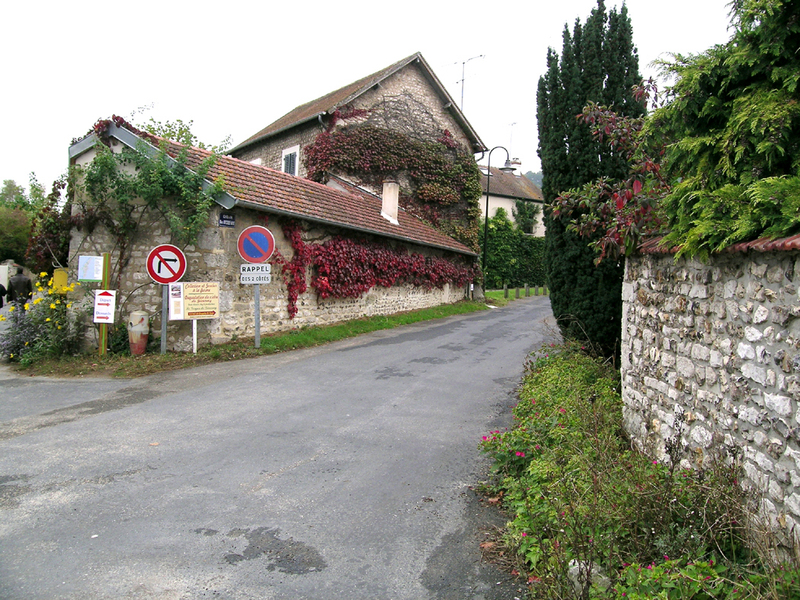 Monet settled on a two-acre parcel of land that sloped from the center of the village down toward the small branch of the Epte that runs parallel to the road. There he set up house with his second wife, Alice Hoschedé, and their combined brood. It was a bustling bourgeois home, full of bustles and lace, children and cakes. The house still exists: an odd old farmhouse, it is only one room wide and long as a barn, made of pink stucco, with forest green shutters and doors. Each room is painted in its special color – the kitchen is blue and the dining room is brilliant yellow. Monet had little use for beige. Outside is the “clos Normand,” or the Norman enclosure, where Monet immediately began planting his garden, “so that there would be flowers to paint on rainy days,” he wrote. But the garden took over. By the time he set to work on the great waterlily paintings that he gave to the nation as a gift, he had six gardeners on his staff. 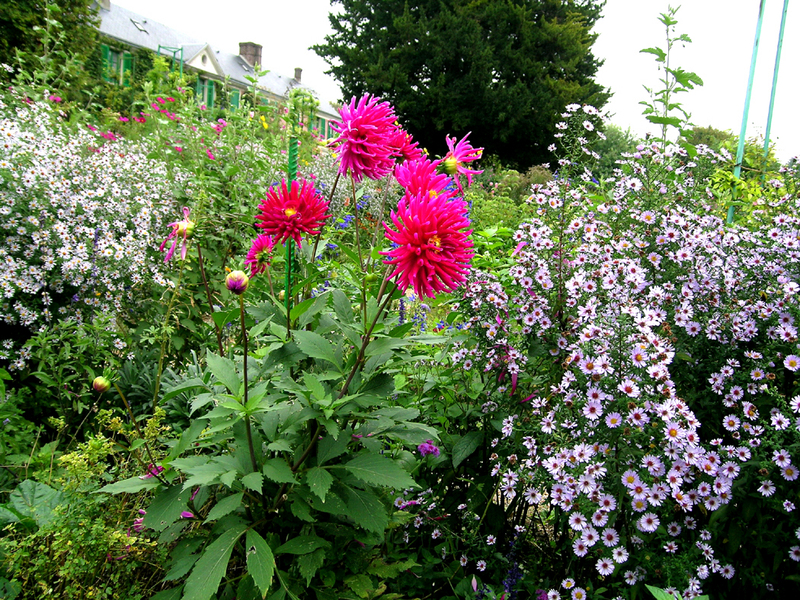 Thousands each year make the pilgrimage to Giverny. 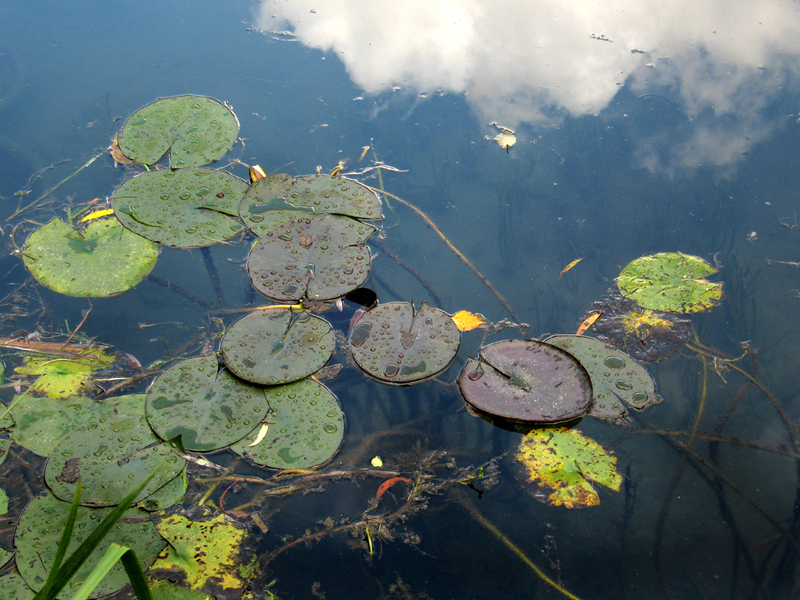 They want to see where Monet worked; they want to see the waterlilies that he made into icons of art. But the gardens still retain their independence: There are those who visit not because of the painter, but because of the flowers themselves. 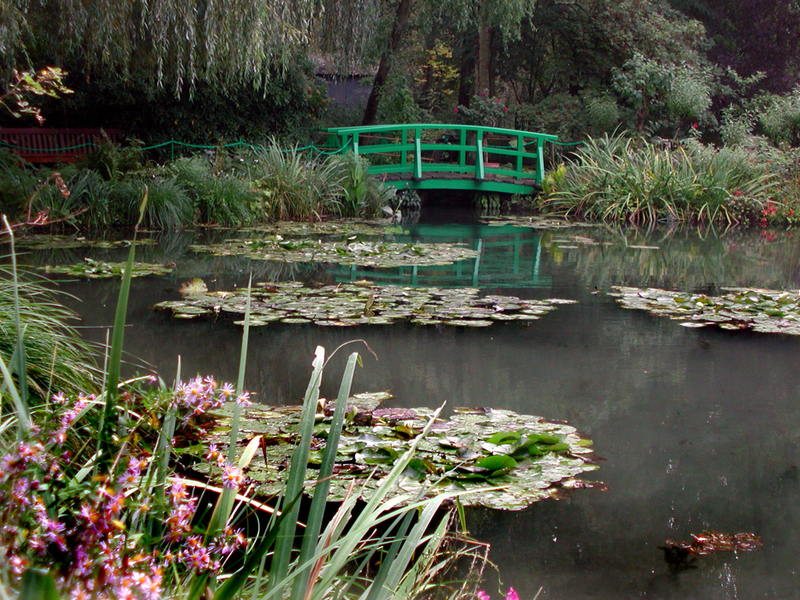 Monet’s property has become one of the greatest gardens in the world. In the summer, the place is crowded, but in the spring and fall, the tourists fade away and you can have the grounds to yourself, or nearly so. One would think that in the middle of October, when the rains are already cold on your skin, the flowers would have died away, but it is not true. 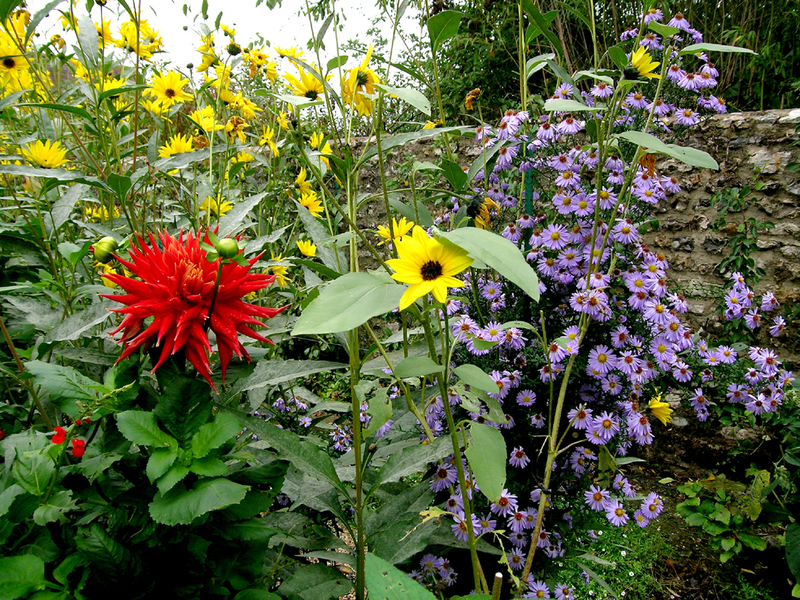 Even then, the clos Normand is riot with the yellows of sunflowers, the reds of dahlias, the blues of asters and the pinks of cosmos. 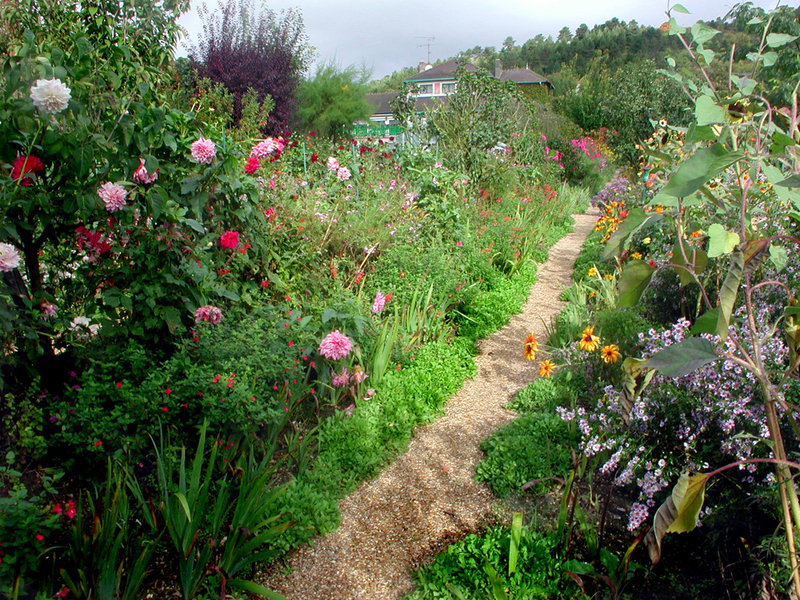 The garden paths are choked with flowers. 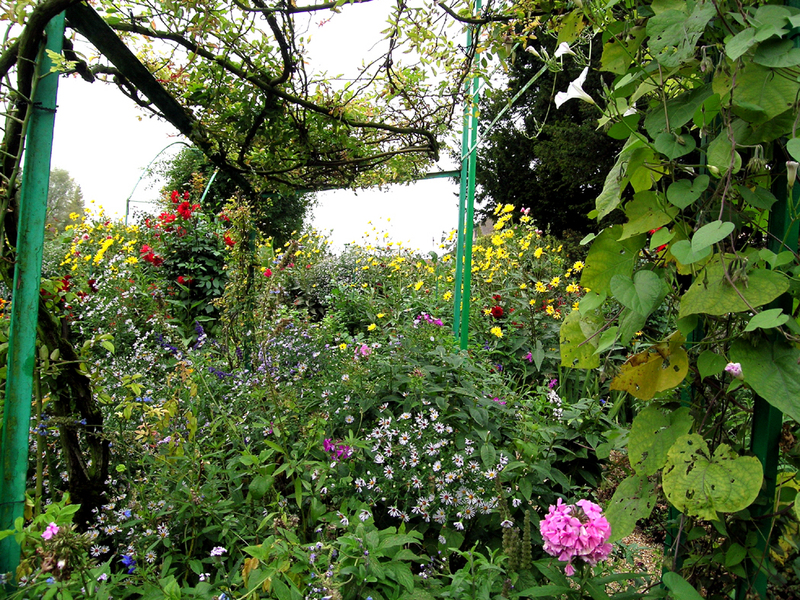 It was an effect that Monet sought: that weedy nature should take over the place, luxuriant in growth. The formal French garden, as you find it in Versailles or the Tuileries, is orderly and tamed. Square and round plots, with a grid of garden path between. Every flower marches in rank and file, as if their gardeners were drill sergeants. 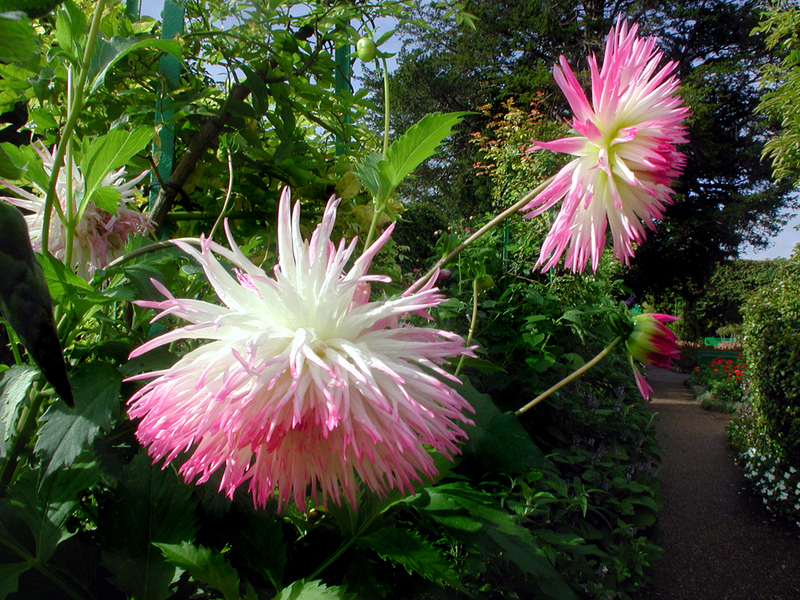 In distinction, the English garden gives us a different vision of nature. There, the meandering forest paths take us past informally planted shrubbery and flower beds, to provide the illusion that we are not in a garden at all, but rather walking through some especially lush bit of wildness. 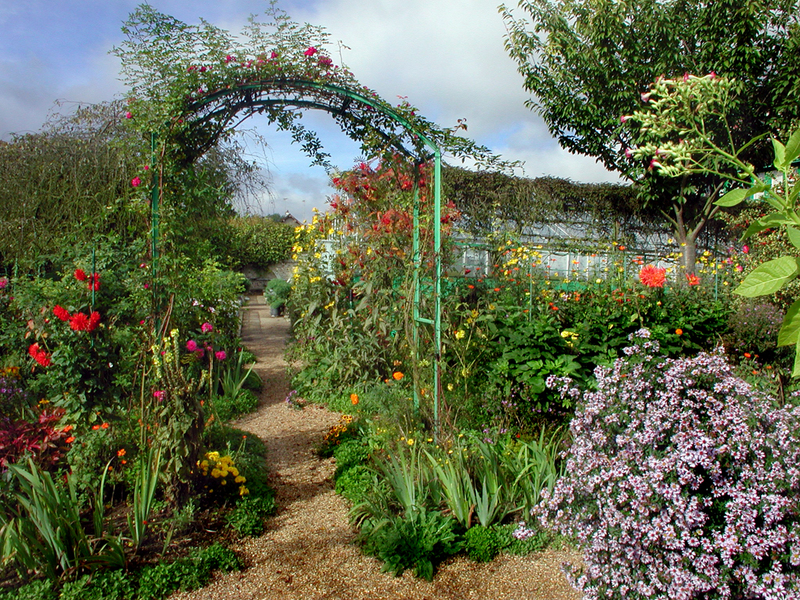 Monet’s garden is a hybrid of these: The paths are rectilinear and formal, but the plants have taken over, spreading out over the footways, up into the air and intertwined with each other. There is a formal layout, but a rich chaos of growth defeating the formality. 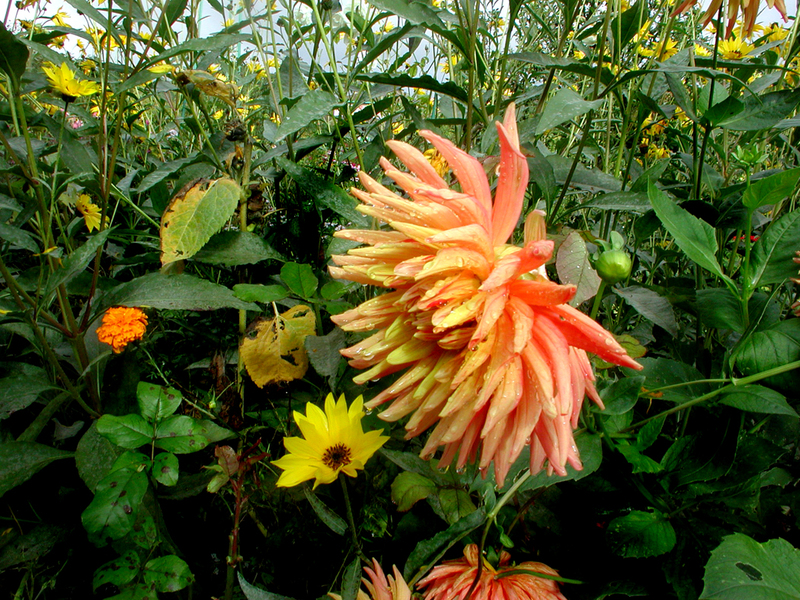 It creates the illusion of a patch of garden left untended so the flowers grow rampant. The effect is still overpowering. 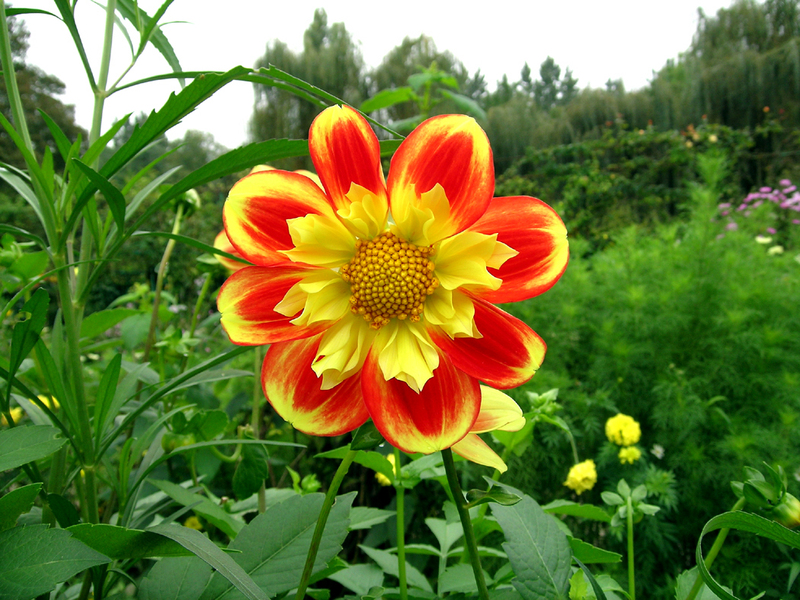 Instead of looking down at patches of roses or dahlia, they instead grow up to nose-height, so they force their aroma into your nostrils. They rise to eye level as you walk the paths. They hang overhead and dangle down at you. “What wondrous life is this I lead! 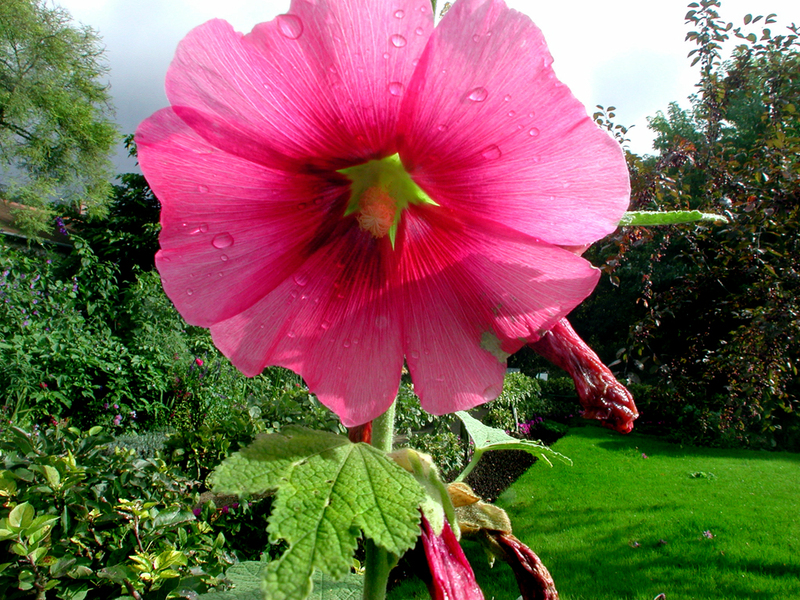 The present gardens are a miracle. 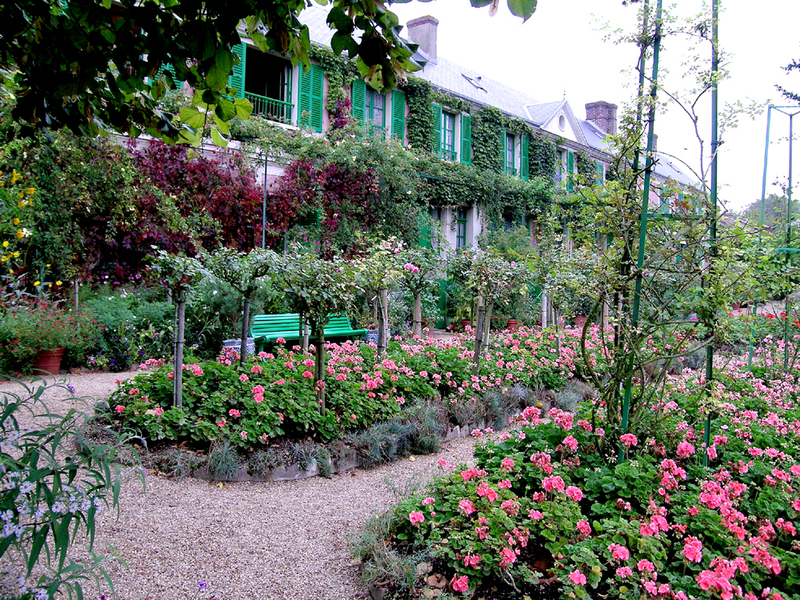 After Monet’s death, his family dispersed and eventually left the old homestead to ruin. The gardens fell untended, the house sprung leaks. The artist’s son, Michel, hadn’t lived there for decades and showed little interest in keeping the place up. When he died, in 1966, he bequeathed both estate and paintings to the French Academy of Fine Arts. The grounds were slowly restored and the gardens replanted, taking as their guides the many paintings and photographs that had documented the place. 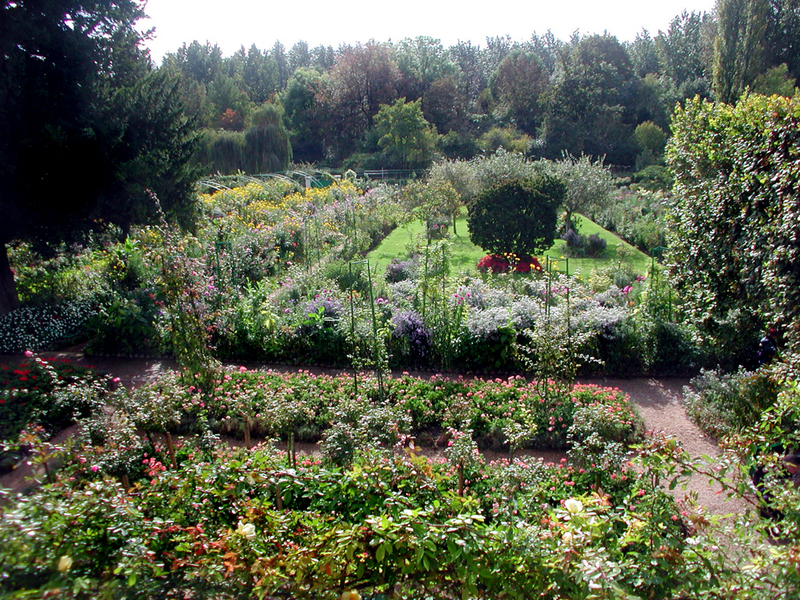 And in 1980, the gardens were opened to the public, nearly 100 years after Monet first started planting bulbs. Modern visitors find a large parking lot south of the gardens, within easy walking distance. 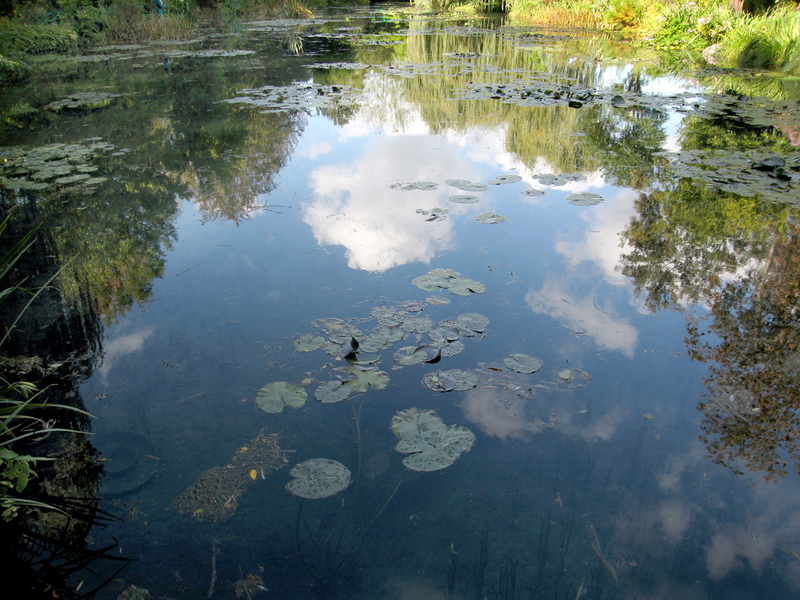 The entrance to the garden takes them first through the large studio Monet had built to paint his large waterlilies in. It is now also the gift shop. Through that and into the clos Normand, you get your first view of the long shotgun house, covered in vines and flowers. 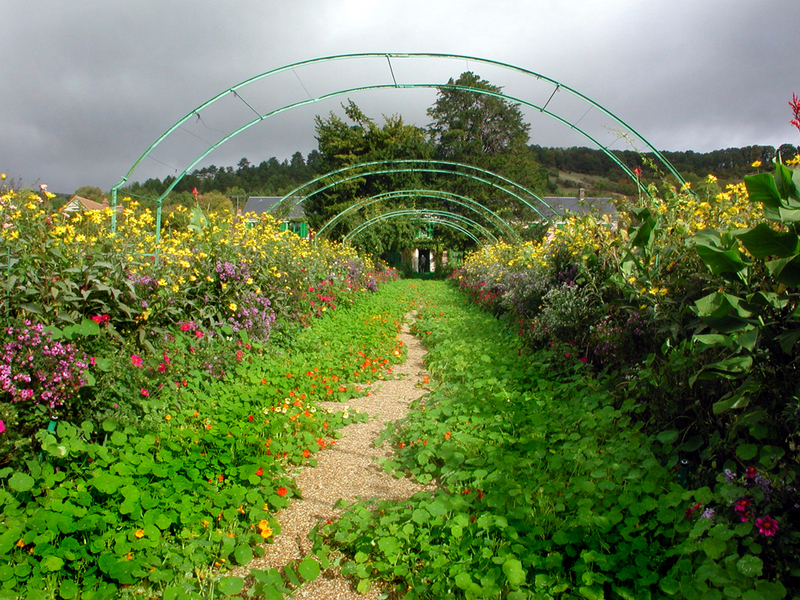 The clos is gridded with pathways, skied-in with trellises and arches and splattered with the petal-dots of color. As Monet himself wrote of them, “The overall effect is endlessly varied. Oh what a lovely tour and bit of history! I love your photo of the sky reflected in the water. 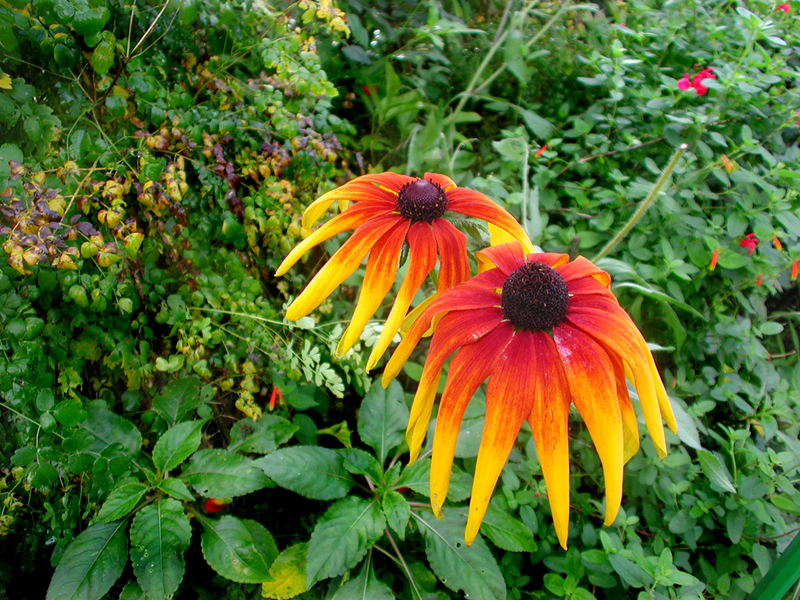 I have been to Giverny twice both times in Autumn. You have really captured its beautify and tranquility. It is a charming place to visit! I used to be a regular visitor to the National gallery in London. It was magical sitting in the room with several of his large waterlily paintings. Both experiences are treasured memoirs that you have brought back to life. Thank you! Oh! Thank you so much for writing so vividly about a place I dream of visiting! The photos are a wonderful accompaniment. Lovely. Just lovely.